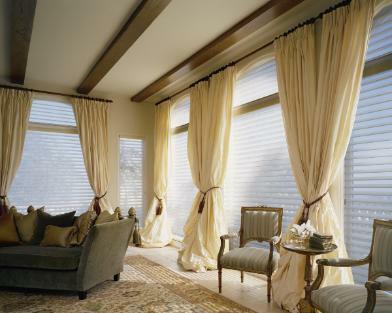 Specializing in quality window treatments with a custom and luxurious look. We also do renovations! See our Renovations page for more information. Custom Blinds and Shades on your windows are both beautiful and functional. Blinds and shades block out damaging UV rays which can discolour floors, furniture and artwork. Blinds and shades have energy efficient properties, lowering utility bills. Blinds and shades also control the amount of light and privacy in your home, which is probably the biggest reason people choose to dress their windows. And lets not forget the beauty of blinds and shades, they add a layer of design and decor to any home. We strive to provide exceptional customer service and we always put the client first to ensure that our clients end up with treatments that are right for them and their space. We carry the full line of Hunter Douglas, offering a fabulous selection of custom blinds and shades.